Individuals can create their professional profile about their artistic background, expertise, and experience, at the same time showcase some of their creativity by uploading their work on the platform. Groups can create their team by having all the members of the group listed and getting their comprehensive body of creative work published. Talent hunting is about getting access to the right talent at a short notice. This happens by having the right kinds of filters and selection criteria. One can search for talent based on various criteria, be it location, experience, the area of expertise, training, performances, ratings, sample piece of work being uploaded, etc. One also gets to see recommended talent (by Hiya) specifically selected for a user, based on Hiya’s internal criteria. It is very important that a piece of creative work gets tagged to right classification for relevance, faster search, access to the right audience. The platform provides a detailed 4 tier classification structure against which an uploaded piece of work or personal field of expertise or an event or a course offered by a training institute, etc. can be classified. Almost everything in this platform has the capability to get classified at the right level and detail. The classification starts with 7 major Areas (Art, Creative Writing, Dance, Fashion, Music, Photography, and Theatrics). These areas are then further classified at Category, Sub-category, and Micro-category level. For the first time in the social networking space, we have introduced the concept of Peers and Experts. These two concepts are very important, especially in any Talent ecosystem. A Peer is defined as someone who has one or many similar Areas of Interest. On the other hand, an Expert (a self-declared expert) is someone who has deep expertise based on his past training & experience. An Expert is again very specific to a particular Area, Category, Sub-category, and Micro-category, even though he/she may have wider Areas of interests. This is one of the ways to recognize talent as an Expert on this platform. However, this comes with a price; there are certain criteria that an Expert has to fulfil in order to remain an Expert after initial sign-up. Hiya provides a much-focussed platform for networking among like-minded creative people. One can add and connect with known friends and get acquainted with new ones and in the process, know of each other’s background and view uploaded creative work based on privacy settings. This, in turn, will enable collaboration and learnings. Events form an important channel for any art lover to express and experience creativity. Using Hiya, one can publish an event for the others (friends, family, peers and public) to come and experience it. It can be a public event or a private event. Similarly, one can search for the most relevant event for oneself, again based on the specific classification of the event and other criteria. The platform also allows Event Organisers to list their events and market them to a relevant & targeted set of potential audiences. It is recognition time. For all your creative work, one would like to hear comments, feedback, and ratings from friends and family, peers, and experts. Similarly, one can rate others’ (friends, peers) creative work. The training institute can themselves get rated by students and similarly their courses and their specific training areas can get rated by students. There is also a provision to rate events. Training Institutes & Art Schools can list themselves, share their specialization areas. They can list their courses and accept inquiries about these courses from potential students. Trainers, Star Students (people who have excelled in their fields) and Past students can get listed with the Art Schools, which enhances the credibility of the Art Schools. Contests are a nice way to compete with friends and peers. It gives an assessment of one’s skills at the same time reward/award/recognizes talent. On Hiya, one can create contests for others to apply, at the same time chose from a plethora of contests to participate in. This is primarily to promote a professional career in the creative space. The intention is to democratize all forms of art. Today, art is still the privilege of a few based on one’s network. Through our platform, we provide the network, the avenues, and the channel to search for diverse opportunities to pursue Art as a career. On the other hand, talent hunters, event organizers, publishers can use this platform to offer various career opportunities. There are Blogs and there are Blogs. Blogs are an important way of sharing knowledge, views and sometimes emotions. Hiya is the platform, which is focussed on creative community to come and share articles and blogs on diverse creative space. Again, like everything else, the blogs can be classified to the right area, category, sub-category and micro-category for faster and appropriate access by the reader. There are diverse avenues to learn things, from history to contemporary stuff, through daily Quizzes, user-generated articles, and blogs, tutorials, & specific articles and write-ups created by the Hiya team, etc. There is always a desire to search for a neighbourhood / nearby coach, in the vicinity, in the community where one lives, to learn on various creative skills. Similarly someone who has creative expertise in an area is always searching for students in the vicinity, to earn a living or add to his income. Hiya offers the opportunity to users to offer their coaching services to people who are seeking it, within the vicinity of a community. This platform is also about having fun with friends, family, and peers. 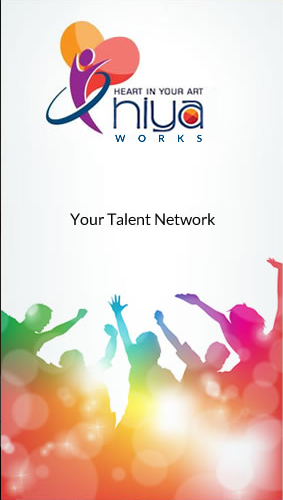 One can track his / her popularity index which is dependent on the size of one’s network, a number of files shared as part of creative work, the number of blogs written, likes and views of files and blogs shared, the number of contests, opportunities and events shared for the creative network at Hiya. Also through daily quizzes, one can not only enhance one’s knowledge but also compete with friends, peers, and rest of the community on the platform. We take privacy and security very seriously. In terms of privacy, one can selectively restrict access to profile, address and contact details. Also, we want to provide absolute flexibility in what one shares with others in the form of their creative work. One can, therefore, select his portfolio of work (at the individual file level) to be shared amongst his friends, peers, experts, specific individuals. Similarly, one can give permission to friends, peers, experts, specific individuals to rate his/her creative work and view the ratings associated with them. We don't share our data with others. This is a place of original content being shared by the people who owns/ co-owns these creative work. In that sense, we expect the users to upload only self-copyrighted pieces of work only and not something which one is not part of.